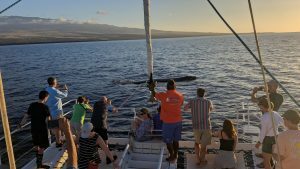 I spend a lot of moments this time of year trying to figure out the best way to describe our Whale Watch Cruises so that you can share in the excitement. Sadly, I know that even my best narratives don’t completely convey the adventure. So today, here’s something a bit different. Keeping in mind that federal regulations require we stay at least 100 yards from any Humpbacks we see, sometimes we’re lucky and the whales approach our idling boat. Case in point – take a look at these pictures from Monday’s Whales & Cocktails at Sunset Cruise. 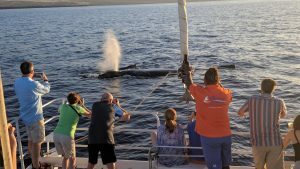 Mom Humpback and her baby made a pass right across our bow. It looked to us like the baby was pretty curious….but check out that second photo to find out how the story ended! Enlarge this photo, and you’ll see baby attempting to cut in front of Mom to check out the boat. Enlarge this photo and you’ll see that Mom wasn’t having it…she diverted the baby with her huge head! Ocean Sports Whale Fact of the Day: An average size adult Humpback has 2 oval shaped blowholes that measure about 9 inches in diameter (on the bigger part of the oval). The whales use them like you use your nostrils, exhaling through both before inhaling. If an average size human had nostril openings in the same proportion to his size as a whale’s blowholes are to the whale’s body size, each human nostril would measure about an inch and a quarter in diameter. We’ll wait while you find a ruler to see how your’s measure up!